Updated 4:50 p.m. Dec. 8: Oh, what a centennial season it was for the UC Davis Aggies. The program won its first Big Sky Conference title (with a 7-1 record), Dan Hawkins was named co-coach of the year and UC Davis made its first appearance in the Football Championship Subdivision playoffs since moving up to the NCAA’s Division I FCS in 2005. Plus we hosted a playoff game, defeating Northern Iowa, 23-16, in a packed Aggie Stadium last weekend to advance to a quarterfinal game today (Dec. 8) at Eastern Washington University. Just a month ago, Eastern Washington handed UC Davis its only loss in conference play this season. But the Aggies would not get their revenge, losing 34-29 to the Eagles in 27-degree weather in Cheney, Washington, and finishing the program’s 100th season with a 10-3 record. Indeed, the Aggies and Eagles were tied at halftime, 14-14, and started out on a similar path in the second half. The Aggies went up, 21-14, in the third quarter, on a 9-yard pass play from Jake Maier to Lance Babb, and then, just under 5 minutes into the fourth quarter, Eagles’ quarterback Eric Barriere ran 5 yards to tie the game again. Things got interesting after the Eagles scored again to take a 28-21 lead. The Aggies gained good field position on a punt, drove to the Eagles’ 3-yard-line (a 27-yard pass from Maier to Keelan Doss helped the Aggies get there) and scored on a Maier shovel pass to Ulonzo Gilliam, who bulldozed his way into the end zone for his third touchdown of the game. That made the score EWU 28, UC Davis 27 before the extra-point kick and another tie score. But, with 1:13 left in the game, Coach Hawkins elected to go for a 2-point conversion — and the Aggies did it! Maier tossed another shovel pass, this time on a reverse to Namine Modise, who ran around left end to get the extra-extra points. The Eagles responded as if their lives depended on it — and they did — going 75 yards for a touchdown in 47 seconds, taking the lead 34-29 (they tried a 2-point conversion of their own, but failed) and holding on for the win. Read Aggie Athletics’ coverage of the game. Eastern Washington, the No. 3 seed in the FCS bracket, is the last Big Sky team in the tournament, after defeating No. 6 UC Davis and after No. 7 Maine scored an upset win over No. 2 Weber State, 23-18, Friday night. In the semifinals next weekend, the Eagles (11-2) will host the Maine Black Bears of the Colonial Athletic Conference (10-3), and No. 1 North Dakota State (13-0) will host its next-door and Missouri Valley Football Conference rival, No. 5 South Dakota State (10-2). The winners will square off in the title game Saturday, Jan. 5, at Toyota Stadium in Frisco, Texas. Updated 10:30 a.m. Dec. 5: Aggie Athletics today announced a pair of watch parties for Saturday’s game. See “At a Glance” box for details. For UC Davis football, the road to the FCS “final four” runs through Eastern Washington University in Cheney, Washington, home of the Eagles, the only team to beat the Aggies in conference play this season. RADIO: 1380 KTKZ over the air (AM) or online via TuneIn. @UCDfootball on TWITTER: Live stats and highlights. Aggie Athletics official — Woodstock’s Pizza, 219 G St., Davis, with food and drink specials (including Gunrock Lager on tap). On-campus — UC Davis students are invited to watch the game on a big screen in the Segundo Dining Commons. Check the UC Davis Postseason Central website for the latest news about the game and activities surrounding the game. UC Davis and Eastern Washington, both 10-2 on the year, will play this Saturday (Dec. 8), kickoff 1 p.m. PST, to see which team will go to the semifinals in the NCAA’s Football Championship Subdivision playoffs. Nov. 10, in Cheney, during the regular season, Eastern Washington defeated UC Davis, 59-10 — setting up this week’s playoff as a revenge game. Make that a cold revenge game: The Weather Channel is predicting a game-day temperature around freezing, under a cloudy sky with a 20 percent chance of precipitation. Can’t be there for the game, or you’d rather stay put in our forecasted 57-degree weather? See box for information on two just-announced watch parties, one off campus, the other on campus. UC Davis and Eastern Washington each ended the Big Sky season with a 7-1 mark to share the conference title with a third 7-1 team, Weber State. The Aggies and Eagles both won last Saturday (Dec. 1) — UC Davis defeated Northern Iowa, 26-13, in a packed Aggie Stadium (see below for more about the game, including our ESPN Top-10 Play of the Week), and EWU defeated Nicholls State, 42-21, in Cheney — to advance to this weekend’s quarterfinals. The FCS playoff bracket started with 24 teams, with eight of them seeded at the top: 1. North Dakota State; 2. Weber State; 3. Eastern Washington; 4. Kennesaw State; 5. South Dakota State; 6. UC Davis, 7. Maine; and 8. Colgate. All of them won Dec. 1 and are squaring off Dec. 8; each game will be played on the campus of the team with the higher seed. The semifinals are scheduled for Friday or Saturday, Dec. 14 or 15, on the campuses of the higher-seeded schools, and the final is set for Saturday, Jan. 5 at Toyota Stadium in Frisco, Texas. 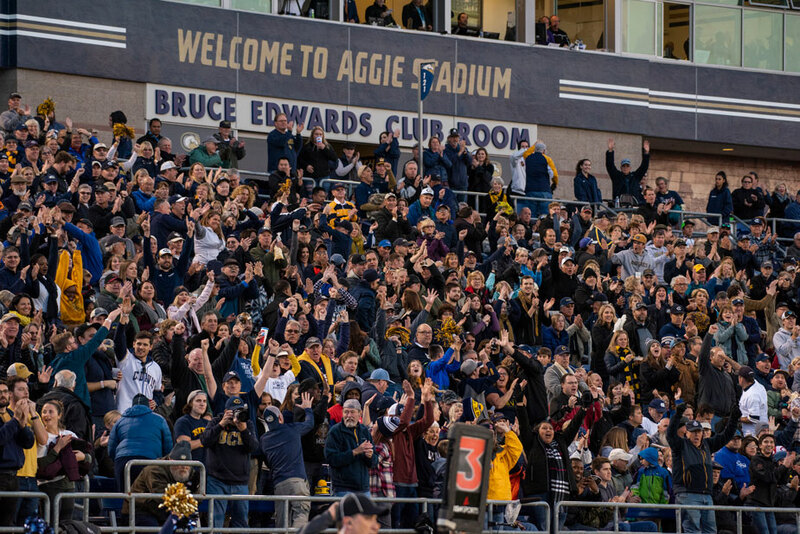 The UC Davis-Northern Iowa game — the Aggies’ first-ever appearance in the FCS playoffs since moving from Division II to Division I a dozen years ago — drew 8,306 fans to Aggie Stadium, third highest attendance among the eight FCS games played Saturday. Watch all 10 or fast forward to 3:13 to see the fourth-best play of the week, a 31-yard pass from Jake Maier to Keelan Doss, leading to a Max O’Rourke field goal to end the first half with UC Davis in front of Northern Iowa, 16-6. MORE VIDEO: See head coach Dan Hawkins in a post-game interview with ESPN, talking about UC Davis and its academics and Aggie Pride. Indeed, as a Division II program the Aggies won 20 straight conference championships. 1971-90. UC Davis moved up to Division I in 2007 and captured its first Big Sky Conference title this year. 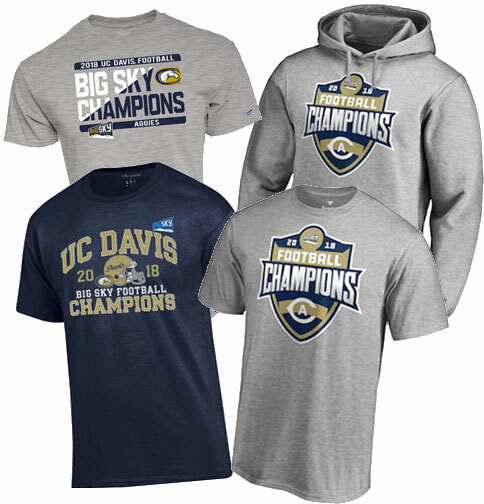 Big Sky Championship T-shirts and hoodie are pictured below, with details on how to get them. This incredible season comes amid Aggie football’s centennial year. Take a look back in this story from UC Davis Magazine. A touchdown ahead late in the game, UC Davis sealed its win when linebacker Mason Moe broke up a fourth-and-10 Northern Iowa pass attempt. “While UC Davis has been using its powerful offense to roll up points all season long, what transpired (Dec. 1) was an old-fashioned defensive battle between FCS first-timer UC Davis and a Northern Iowa team that has been in the FCS playoffs 20 times,” Bob Dunning wrote in his game story in The Davis Enterprise. Lower left: Available at the Campus Store and online. On the right: This T-shirt is available in several styles, along with the hoodie, online.